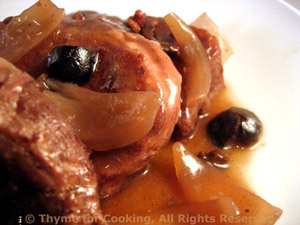 Braised Pork Loin with Red Wine and Olives, easy gourmet dinner recipes. Start the pork and let it cook while you do something else... It even could be made ahead and reheated. An easy dinner for Saturday night. Have leftover pork for lunch - or get a smaller roast. Braising pork makes the meat incredibly tender; the red wine and olives give it a bit of Mediterranean flavor. This will serve four or be enough for two meals. Slice shallots in quarters through the stem end. Heat oil in heavy pot or Dutch oven. Add shallots, garlic and sauté until tender, about 5 minutes. Add pork and brown on all sides. Add 1/4 cup of wine and stir up all the browned bits from the bottom of the pan. Return shallots, garlic to pot and add remaining wine, herbs and tomato paste. Bring to a boil, cover, reduce heat to a slow simmer and braise for 75 minutes. After 75 minutes add the olives. Increase heat under shallots and olives. Add cornstarch and stir until thickened and clear. Slice some of the pork and arrange on a small platter. Spoon some Red Wine Sauce over and serve. Put potatoes in medium saucepan and add just enough water to cover. Add salt and cover. Bring to a boil over medium heat. When boiling (and pay attention or they will boil over) reduce heat and take cover partially off. Continue cooking until done, 15 - 20 minutes. They should be very done, easily coming apart when poked with a fork. Clean and thinly slice the leek. Heat butter in a small pan over medium-low heat. Sauté leeks until soft being careful not to let it brown. When tender add the milk. Cover and keep warm until ready to use in the potatoes. 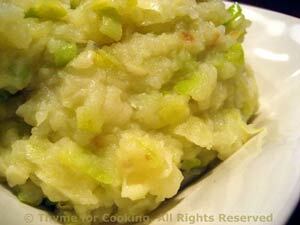 Add enough of the leek/milk mixture to get your desired consistency. If, after adding all of it, the potatoes are still too stiff, add a bit more milk. 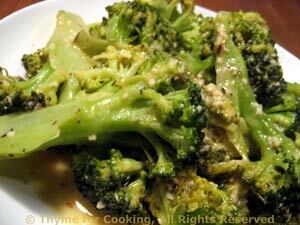 Like some other cruciferous vegetables (Brussels Sprouts) broccoli is best if not overcooked. The light, lemony mustard sauce will make this vegetable a favorite. Put in steamer basket in saucepan with an inch of water in bottom. Put on medium heat and steam for 10 - 15 minutes or just until done, careful not to overcook. In same pan heat oil. Mince garlic and add to pan. Sauté briefly, then add mustard, lemon and stock. Stir well to combine.